The flightless dung beetle occupies an ecological niche, exploiting animal droppings as a food source. In ecology, a niche (CanE, UK: /ˈniːʃ/ or US: /ˈnɪtʃ/) is the match of a species to a specific environmental condition. It describes how an organism or population responds to the distribution of resources and competitors (for example, by growing when resources are abundant, and when predators, parasites and pathogens are scarce) and how it in turn alters those same factors (for example, limiting access to resources by other organisms, acting as a food source for predators and a consumer of prey). "The type and number of variables comprising the dimensions of an environmental niche vary from one species to another [and] the relative importance of particular environmental variables for a species may vary according to the geographic and biotic contexts". A Grinnellian niche is determined by the habitat in which a species lives and its accompanying behavioral adaptations. An Eltonian niche emphasizes that a species not only grows in and responds to an environment, it may also change the environment and its behavior as it grows. The Hutchinsonian niche uses mathematics and statistics to try to explain how species coexist within a given community. The concept of ecological niche is central to ecological biogeography, which focuses on spatial patterns of ecological communities. "Species distributions and their dynamics over time result from properties of the species, environmental variation..., and interactions between the two—in particular the abilities of some species, especially our own, to modify their environments and alter the range dynamics of many other species." Alteration of an ecological niche by its inhabitants is the topic of niche construction. The majority of species exist in a standard ecological niche, sharing behaviors, adaptations, and functional traits similar to the other closely related species within the same broad taxonomic class, but there are exceptions. A premier example of a non-standard niche filling species is the flightless, ground-dwelling kiwi bird of New Zealand, which feeds on worms and other ground creatures, and lives its life in a mammal-like niche. Island biogeography can help explain island species and associated unfilled niches. 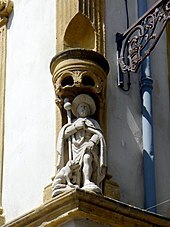 The ecological meaning of niche comes from the meaning of niche as a recess in a wall for a statue, which itself is probably derived from the Middle French word nicher, meaning to nest. The term was coined by the naturalist Roswell Hill Johnson but Joseph Grinnell was probably the first to use it in a research program in 1917, in his paper "The niche relationships of the California Thrasher". The Grinnellian niche concept embodies the idea that the niche of a species is determined by the habitat in which it lives and its accompanying behavioral adaptations. In other words, the niche is the sum of the habitat requirements and behaviors that allow a species to persist and produce offspring. For example, the behavior of the California thrasher is consistent with the chaparral habitat it lives in—it breeds and feeds in the underbrush and escapes from its predators by shuffling from underbrush to underbrush. Its 'niche' is defined by the felicitous complementing of the thrasher's behavior and physical traits (camouflaging color, short wings, strong legs) with this habitat. This perspective of niche allows for the existence of both ecological equivalents and empty niches. An ecological equivalent to an organism is an organism from a different taxonomic group exhibiting similar adaptations in a similar habitat, an example being the different succulents found in American and African deserts, cactus and euphorbia, respectively. As another example, the anole lizards of the Greater Antilles are a rare example of convergent evolution, adaptive radiation, and the existence of ecological equivalents: the anole lizards evolved in similar microhabitats independently of each other and resulted in the same ecomorphs across all four islands. In 1927 Charles Sutherland Elton, a British ecologist, defined a niche as follows: "The 'niche' of an animal means its place in the biotic environment, its relations to food and enemies." For instance there is the niche that is filled by birds of prey which eat small animals such as shrews and mice. In an oak wood this niche is filled by tawny owls, while in the open grassland it is occupied by kestrels. The existence of this carnivore niche is dependent on the further fact that mice form a definite herbivore niche in many different associations, although the actual species of mice may be quite different. Conceptually, the Eltonian niche introduces the idea of a species' response to and effect on the environment. Unlike other niche concepts, it emphasizes that a species not only grows in and responds to an environment based on available resources, predators, and climatic conditions, but also changes the availability and behavior of those factors as it grows. In an extreme example, beavers require certain resources in order to survive and reproduce, but also construct dams that alter water flow in the river where the beaver lives. Thus, the beaver affects the biotic and abiotic conditions of other species that live in and near the watershed. In a more subtle case, competitors that consume resources at different rates can lead to cycles in resource density that differ between species. Not only do species grow differently with respect to resource density, but their own population growth can affect resource density over time. The shape of the bill of this purple-throated carib is complementary to the shape of the flower and coevolved with it, enabling it to exploit the nectar as a resource. The Hutchinsonian niche is an "n-dimensional hypervolume", where the dimensions are environmental conditions and resources, that define the requirements of an individual or a species to practice "its" way of life, more particularly, for its population to persist. The "hypervolume" defines the multi-dimensional space of resources (e.g., light, nutrients, structure, etc.) available to (and specifically used by) organisms, and "all species other than those under consideration are regarded as part of the coordinate system." The niche concept was popularized by the zoologist G. Evelyn Hutchinson in 1957. Hutchinson inquired into the question of why there are so many types of organisms in any one habitat. His work inspired many others to develop models to explain how many and how similar coexisting species could be within a given community, and led to the concepts of 'niche breadth' (the variety of resources or habitats used by a given species), 'niche partitioning' (resource differentiation by coexisting species), and 'niche overlap' (overlap of resource use by different species). Where three species eat some of the same prey, a statistical picture of each niche shows overlap in resource usage between three species, indicating where competition is strongest. Statistics were introduced into the Hutchinson niche by Robert MacArthur and Richard Levins using the 'resource-utilization' niche employing histograms to describe the 'frequency of occurrence' as a function of a Hutchinson coordinate. So, for instance, a Gaussian might describe the frequency with which a species ate prey of a certain size, giving a more detailed niche description than simply specifying some median or average prey size. For such a bell-shaped distribution, the position, width and form of the niche correspond to the mean, standard deviation and the actual distribution itself. 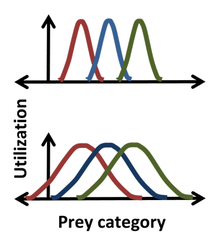 One advantage in using statistics is illustrated in the figure, where it is clear that for the narrower distributions (top) there is no competition for prey between the extreme left and extreme right species, while for the broader distribution (bottom), niche overlap indicates competition can occur between all species. The resource-utilization approach consists in postulating that not only competition can occur, but also that it does occur, and that overlap in resource utilization directly enables the estimation of the competition coefficients. This postulate, however, can be misguided, as it ignores the impacts that the resources of each category have on the organism and the impacts that the organism has on the resources of each category. For instance, the resource in the overlap region can be non-limiting, in which case there is no competition for this resource despite niche overlap. An organism free of interference from other species could use the full range of conditions (biotic and abiotic) and resources in which it could survive and reproduce which is called its fundamental niche. However, as a result of pressure from, and interactions with, other organisms (i.e. inter-specific competition) species are usually forced to occupy a niche that is narrower than this, and to which they are mostly highly adapted; this is termed the realized niche. Hutchinson used the idea of competition for resources as the primary mechanism driving ecology, but overemphasis upon this focus has proved to be a handicap for the niche concept. In particular, overemphasis upon a species' dependence upon resources has led to too little emphasis upon the effects of organisms on their environment, for instance, colonization and invasions. The term "adaptive zone" was coined by the paleontologist George Gaylord Simpson to explain how a population could jump from one niche to another that suited it, jump to an 'adaptive zone', made available by virtue of some modification, or possibly a change in the food chain, that made the adaptive zone available to it without a discontinuity in its way of life because the group was 'pre-adapted' to the new ecological opportunity. 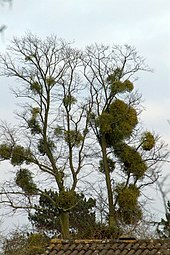 As a hemi-parasitic plant, the mistletoe in this tree exploits its host for nutrients and as a place to grow. Hutchinson's "niche" (a description of the ecological space occupied by a species) is subtly different from the "niche" as defined by Grinnell (an ecological role, that may or may not be actually filled by a species—see vacant niches). A niche is a very specific segment of ecospace occupied by a single species. On the presumption that no two species are identical in all respects (called Hardin's 'axiom of inequality') and the competitive exclusion principle, some resource or adaptive dimension will provide a niche specific to each species. Species can however share a 'mode of life' or 'autecological strategy' which are broader definitions of ecospace. For example, Australian grasslands species, though different from those of the Great Plains grasslands, exhibit similar modes of life. Once a niche is left vacant, other organisms can fill that position. For example, the niche that was left vacant by the extinction of the tarpan has been filled by other animals (in particular a small horse breed, the konik). Also, when plants and animals are introduced into a new environment, they have the potential to occupy or invade the niche or niches of native organisms, often outcompeting the indigenous species. Introduction of non-indigenous species to non-native habitats by humans often results in biological pollution by the exotic or invasive species. The mathematical representation of a species' fundamental niche in ecological space, and its subsequent projection back into geographic space, is the domain of niche modelling. The different dimensions, or plot axes, of a niche represent different biotic and abiotic variables. These factors may include descriptions of the organism's life history, habitat, trophic position (place in the food chain), and geographic range. According to the competitive exclusion principle, no two species can occupy the same niche in the same environment for a long time. The parameters of a realized niche are described by the realized niche width of that species. Some plants and animals, called specialists, need specific habitats and surroundings to survive, such as the spotted owl, which lives specifically in old growth forests. Other plants and animals, called generalists, are not as particular and can survive in a range of conditions, for example the dandelion. ^ a b "Niche". Merriam-Webster Dictionary. Merriam-Webster. Retrieved 30 October 2014. ^ a b c a Pocheville, Arnaud (2015). "The Ecological Niche: History and Recent Controversies". In Heams, Thomas; Huneman, Philippe; Lecointre, Guillaume; et al. (eds.). Handbook of Evolutionary Thinking in the Sciences. Dordrecht: Springer. pp. 547–586. ISBN 978-94-017-9014-7. ^ a b c Three variants of ecological niche are described by Thomas W Schoener (2009). "§I.1 Ecological niche". In Simon A. Levin; Stephen R. Carpenter; H. Charles J. Godfray; Ann P. Kinzig; Michel Loreau; Jonathan B. Losos; Brian Walker; David S. Wilcove (eds.). The Princeton Guide to Ecology. Princeton University Press. pp. 3 ff. ISBN 9781400833023. ^ Mark V Lomolino; Brett R Riddle; James H Brown (2009). "The geographic range as a reflection of the niche". Biogeography (3rd ed.). Sunderland, Mass: Sinauer Associates. p. 73. ISBN 978-0878934867. The geographic range of a species can be viewed as a spatial reflection of its niche Viewable on line via Amazon's 'look-inside' feature. ^ Mark V Lomolino; Brett R Riddle; James H Brown (2009). "Areography: Sizes, shapes and overlap of ranges". Biogeography (3rd ed.). Sunderland, Mass: Sinauer Associates. p. 579. ISBN 978-0878934867. Viewable on line via Amazon's 'look-inside' feature. ^ A Townsend Peterson; Jorge Soberôn; RG Pearson; Roger P Anderson; Enrique Martínez-Meyer; Miguel Nakamura; Miguel Bastos Araújo (2011). "Major themes in niche concepts". Ecological Niches and Geographic Distributions (MPB-49). Princeton University Press. p. 11. ISBN 9780691136882. We will make the crucial distinction between variables that are dynamically modified (linked) by the presence of the species versus those that are not. ... [Our construction] is based upon variables not dynamically affected by the species...in contrast to...those that are subject to modification by niche construction. ^ a b "Niche". Oxford English Dictionary (subscription required). Retrieved 8 June 2013. ^ Johnson, Roswell (1910). Determinate evolution in the color-pattern of the lady-beetles. Washington: Carnegie Institution of Washington. ^ a b Joseph Grinnell (1917). "The niche-relationships of the California Thrasher" (PDF). The Auk. 34 (4): 427–433. doi:10.2307/4072271. JSTOR 4072271. Archived from the original (PDF) on 2016-03-10. ^ Richard J. Huggett (2004). Fundamentals of Biogeography. Psychology Press. p. 76. ISBN 9780415323475. ^ a b Elton, Charles Sutherland (2001). Animal Ecology. University of Chicago Press. p. 64. ISBN 978-0226206394. Retrieved May 14, 2014. ^ "Elton focused on the niche of a species as its functional role within the food chain and its impact upon the environment" Jonathan M. Chase; Mathew A. Leibold (2003). Ecological Niches: Linking Classical and Contemporary Approaches. University of Chicago Press. p. 7. ISBN 9780226101804. ^ Pollock, Michael M.; Naiman, Robert J.; Erickson, Heather E.; Johnston, Carol A.; Pastor, John; Pinay, Gilles (1995). Jones, Clive G.; Lawton, John H. (eds.). Beaver as Engineers: Influences on Biotic and Abiotic Characteristics of Drainage Basins. Springer. pp. 117–126. doi:10.1007/978-1-4615-1773-3_12. ISBN 978-1-4613-5714-8. ^ Armstrong, Robert A.; McGehee, Richard (February 1980). "Competitive Exclusion". The American Naturalist. 115 (2): 151–170. doi:10.1086/283553. JSTOR 2460592. ^ a b Hutchinson, G.E. (1957). "Concluding remarks" (PDF). Cold Spring Harbor Symposia on Quantitative Biology. 22 (2): 415–427. doi:10.1101/sqb.1957.022.01.039. Retrieved 2007-07-24. ^ a b c d Jonathan M. Chase; Mathew A. Leibold (2003). Ecological Niches: Linking Classical and Contemporary Approaches. University of Chicago Press. p. 11. ISBN 9780226101804. ^ Robert H. MacArthur (1958). "Population ecology of some warblers of northeastern coniferous forests" (PDF). Ecology. 39 (4): 599–619. doi:10.2307/1931600. JSTOR 1931600. ^ Rory Putman; Stephen D. Wratten (1984). "§5.2 Parameters of the niche". Principles of ecology. University of California Press. p. 107. ISBN 9780520052543. ^ a b Schoener, Thomas W. (1986). "The Ecological Niche". In Cherret, J. M. (ed.). Ecological concepts: the contribution of ecology to an understanding of the natural world. Cambridge: Blackwell Scientific Publications. ^ Dolph Schluter (2000). "§4.2: The ecological theory". The Ecology of Adaptive Radiation. Oxford University Press. p. 69. ISBN 9780191588327. ^ Garrett Hardin (1960). "The competitive exclusion principle" (PDF). Science. 131 (3409): 1292–1297. doi:10.1126/science.131.3409.1292. PMID 14399717. ^ On the logic of the relation between the niche and the corresponding geographic environment see Barry Smith and Achille Varzi, "The Niche", Nous, 33:2 (1999), 198–222. ^ Hardin G. (1960). "The Competitive Exclusion Principle". Science. 131 (3409): 1292–1297. doi:10.1126/science.131.3409.1292. PMID 14399717. ^ Moseley, William; Perramond, Eric; Hapke, Holly; Laris, Paul (2014). An Introduction to Human-Environment Geography. West Sussex, UK: Wiley Blackwell. p. 81. ISBN 978-1-4051-8932-3.